MANILA -- Davao City Mayor Sara Z. Duterte is “very qualified” to run for senator in the upcoming 2019 mid-term elections, Presidential Spokesperson Harry Roque said Monday, after a nationwide senatorial survey showed her making it into the top 10 possible candidates. “She’s very qualified, of course,” Roque said in a Palace briefing reacting to the Pulse Asia survey results, which showed the top senatorial candidates for the upcoming 2019 mid-term elections. 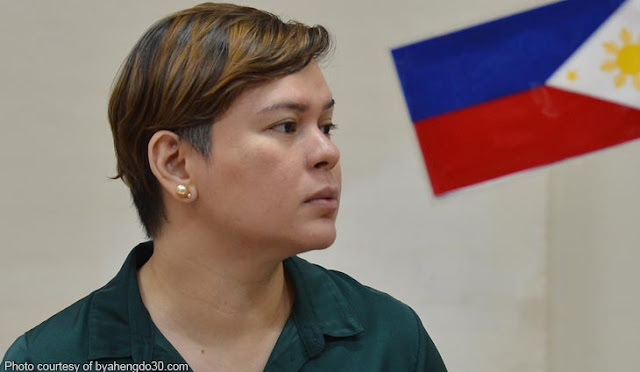 According to the survey, Mayor Sara, President Rodrigo R. Duterte’s daughter, was in fifth to sixth places with 39.5 percent. The younger Duterte earlier said she was overwhelmed by the people’s support but clarified that she was not keen on seeking a national post and would rather remain as mayor. Roque, meanwhile, reiterated that he still had to make up his mind about joining the Senate race. The survey showed Duterte's spokesman ranking 29th to 36th place. He said he was not surprised about receiving a low ranking, lamenting how most senators are elected in office because of fame and power, and not because of possessing the right qualifications. “It doesn’t come as a surprise. In this country, it’s the children of the senators, those who have been in politics who stand a very good chance of being reelected. So nothing has changed,” Roque said. “I’m just an ordinary human being. I don’t belong to any political family, I’m not rich, I’m not surprised. Like everyone else, democracy in the Philippines can be very expensive and depends on who your parents are,” he added. Without naming names, Roque pointed out that there were lawmakers who barely passed any laws, and did not even understand laws and policies. “Bukod sa kanilang relasyon sa kanilang mga ama, ano naman ang kakahayang pinakita nila? Anong mga batas ang naipasa nila (Aside from their relationship with their fathers, what other capabilities have they shown? What laws have they passed)?” Roque said. “Marami doon mga reelectionist, marami doon mga 'comebackee'. Ano ba’ng naririnig niyong mga batas na ginawa nila? Puro investigation, puro pa-istariray. Excuse me, kaya po walang nangyayari sa ating bayan dahil kulang sa bagong polisiya (Many of them are reelectionists, many are comebackees. What laws have they passed? They keep conducting investigations. That’s why there’s nothing happening in our country because we lack new policies),” he added. He acknowledged that it was the people’s responsibility to elect better leaders but noted that they have done their fair share of electing rightful leaders, including President Duterte. “Kasalanan din siguro ng taongbayan 'yan pero may pag-asa pa kasi nga nahalal naman si Presidente Duterte (Perhaps it’s the fault of the people but there’s hope because President Duterte was elected),” Roque said. Asked if senatorial candidates who topped survey results were qualified, Roque said that it was up to the people to decide. According to the Pulse Asia survey, Sen. Grace Poe landed in first place, followed by Sen. Cynthia Villar, Taguig City Rep. Pia Cayetano, and Sen. Nancy Binay. Sen. Edgardo “Sonny” Angara, former Sen. Jinggoy Estrada, Ilocos Norte Gov. Imee Marcos, former Senate President Aquilino “Koko” Pimentel III, and former Sen. Lito Lapid landed seventh to 10th places. Despite what survey results show, Roque said aspiring senatorial candidates should not lose hope even after receiving a low ranking, citing President Duterte as an example. “There’s hope. Remember President Duterte was elected despite the fact that he was in the bottom of the survey at the time of filing of certificate of candidacy. And I think he’s a phenomenon by himself because he rejected the notion of who may be elected into high office in the Philippines,” Roque said. “He proved that it is not always the case, so may pag-asa pa naman doon sa mga nasa hulihan ng listahan (there’s hope for those at the bottom of the list),” he added. In May 9, 2016, Duterte won the elections by a landslide, with over 6.6 million more votes against his closest rival, administration candidate Manuel “Mar” Roxas II, despite initially ranking low in surveys. “Dahil laylayan naman si Presidente Digong nung nagsimula siya (The President started at the bottom) only to win with an overwhelming margin. This much I could say, that perhaps it’s no reason why ordinary people should stop dreaming about being elected in high office,” Roque said. Roque said that a qualified senator must have a good grasp of the law to be able to craft new laws to supplement it.